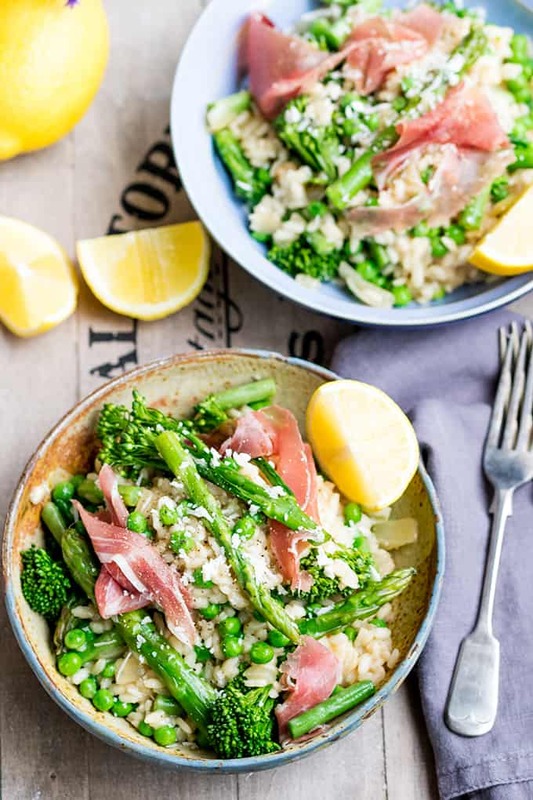 My Spring Vegetable Risotto with Proscuitto is a light-yet-flavourful risotto with lots of crunch green veg! Here I am, optimistically posting spring recipes whilst it’s raining outside and my heating is on full in the house! Oh well, I told you on Wednesday I was going to post this recipe, so here it is. 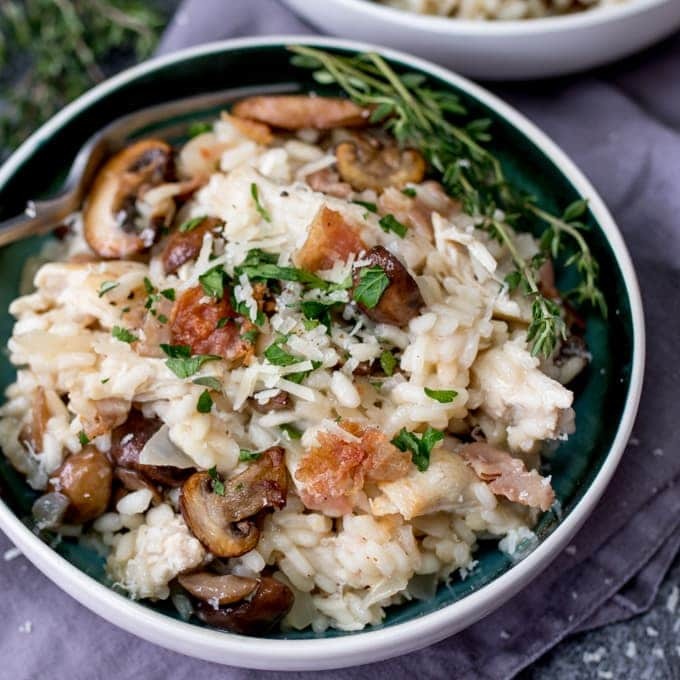 This is my go-to recipe for risotto. 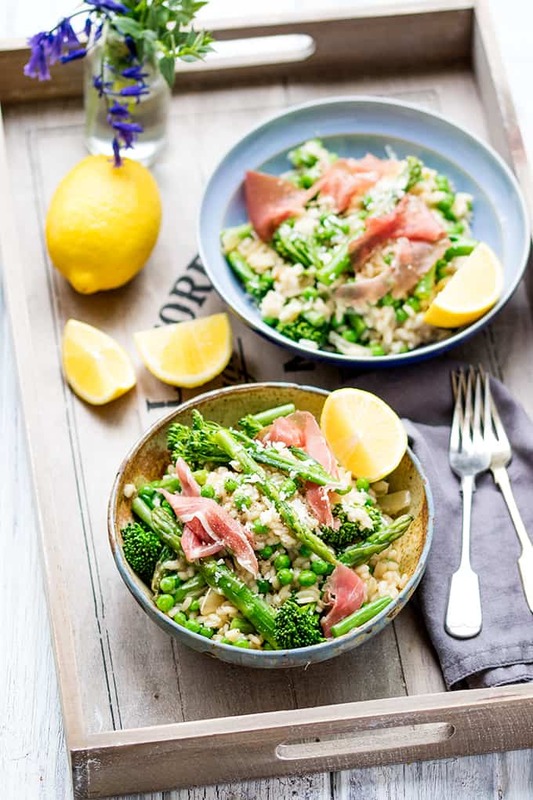 I usually make it without the proscuitto, and serve it with salmon or chicken, but proscuitto has that lovely spring feel about it don’t you think? 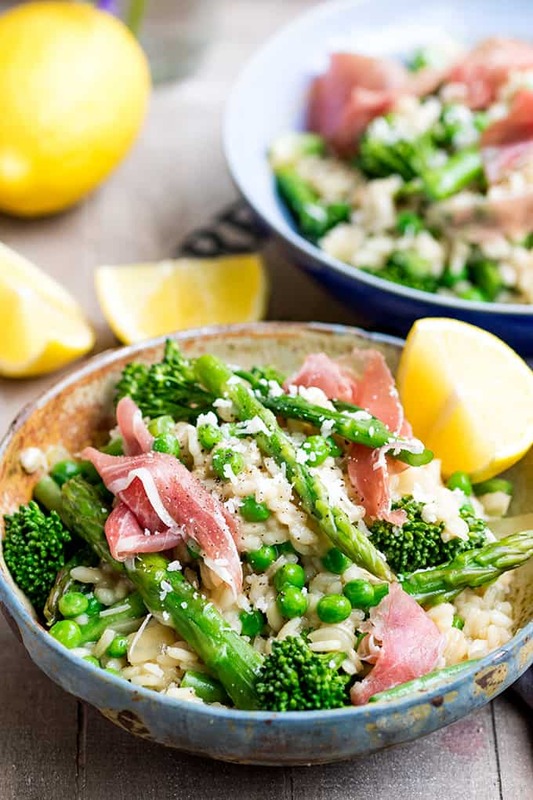 Chris and Gracey call any risotto ‘sloppy rice’ – as if they’ve got something against it. But they ALWAYS have seconds. Lewis actually requests it over chips (strange I know) and loves it even more when I do make it with salmon. That’s my boy! And this is what my mum usually requests when she comes round for tea. So I know this is going to be a winner for you too! I love the fact that it feels satisfying, whilst still making me feel healthy. I’m in my 7th week with my personal trainer now, and this may be the first summer that I’ll actually feel happy to wear strappy tops and shorts! Ten pounds down, another four to go. I’ve been eating properly – no fad diets, and unbelievably, it seems that sensible eating is the errmm…. sensible way to lose weight. Breakfast, lunch and dinner, plus a snack or two during the day. No more food after dinner. Three or four exercise sessions a week, plus a treat day (or sometimes two…). That’s my formula. It’s also a lot of people’s formula I’m sure, but I resisted for so long because I’m a bit greedy and lazy. The evening chocolate munching was the hardest habit to stop (I still have chocolate in the evenings on treat day), and I moaned and grumped for at least two weeks. But I think I’m finally getting used to it. So much so, I haven’t even really thought about it the last week or so. Although we had this for tea last night, we’ll hopefully be starting our extension soon. I’m expecting the kitchen will be ripped out fairly early on, so not a great place for a making videos. I’m still not quite sure how I’m going to cook at all, but hopefully we’ll figure something out!! 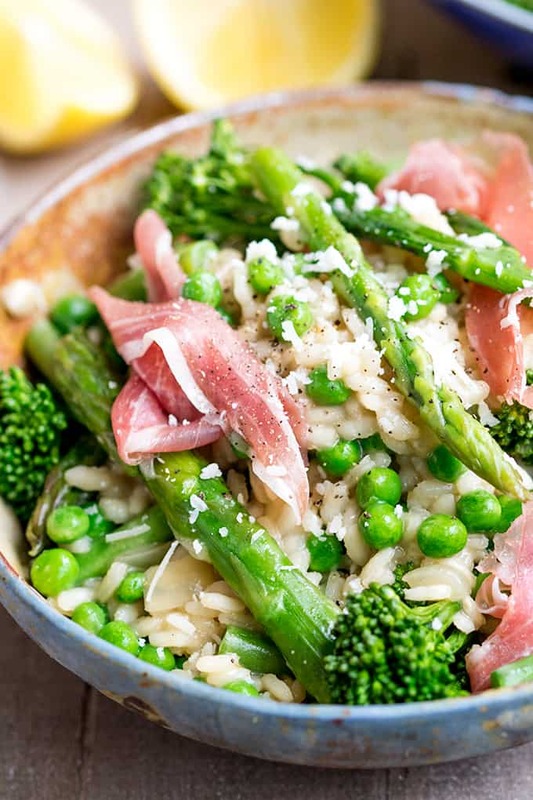 Spring Vegetable Risotto with Proscuitto - light and full of flavour! Heat 1tbsp of oil in a large pan, add the onion and cook for about 5 minutes until the onion starts to go translucent. Add in the garlic, stir and cook for a further minute. Add in the rice and stir until the oil has coated the rice. Add in the wine and stir. Wait for the wine to almost fully absorb (stirring regularly) and then add the stock a ladle at a time - ensuring each ladle has almost fully absorbed before adding the next. Ensure you stir regularly. After about 15 minutes you should have 1 or 2 ladles of stock left. At this point, add in the green beans and broccoli. Stir and continue to cook, adding another ladle of the stock. After another 3-4 minutes add in the peas and asparagus and the final ladle of stock. 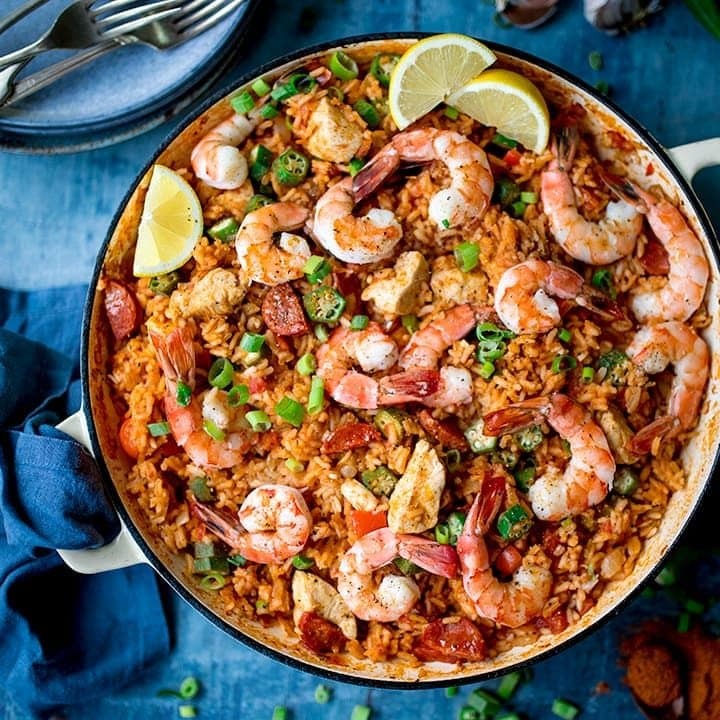 The rice should be almost ready now – if you have a taste, it should have softened but still with a slight bite to it. If the rice is still too hard, you can add in a ladle or so of hot water from the kettle and cook for a minute or two longer. 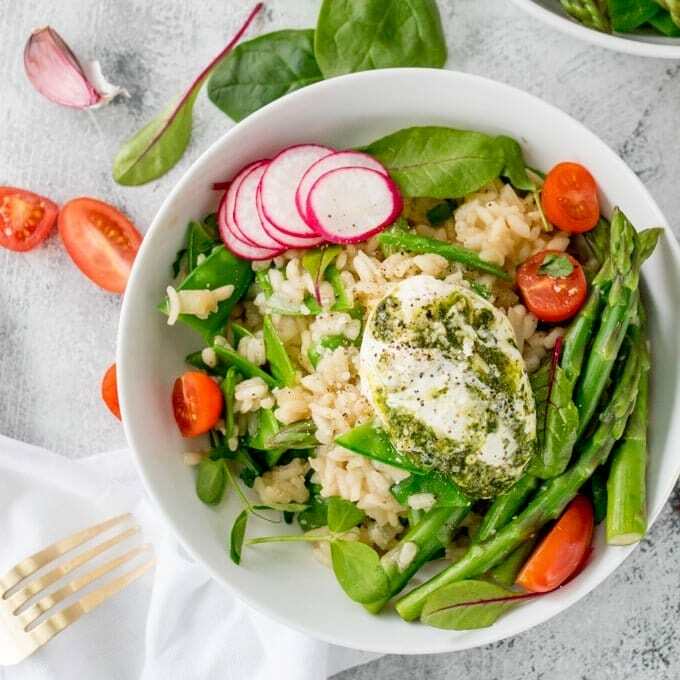 Once the risotto is cooked, turn the heat down to very low. Add in the parmesan, lemon juice and salt & pepper. Give everything a good stir then turn off the heat. 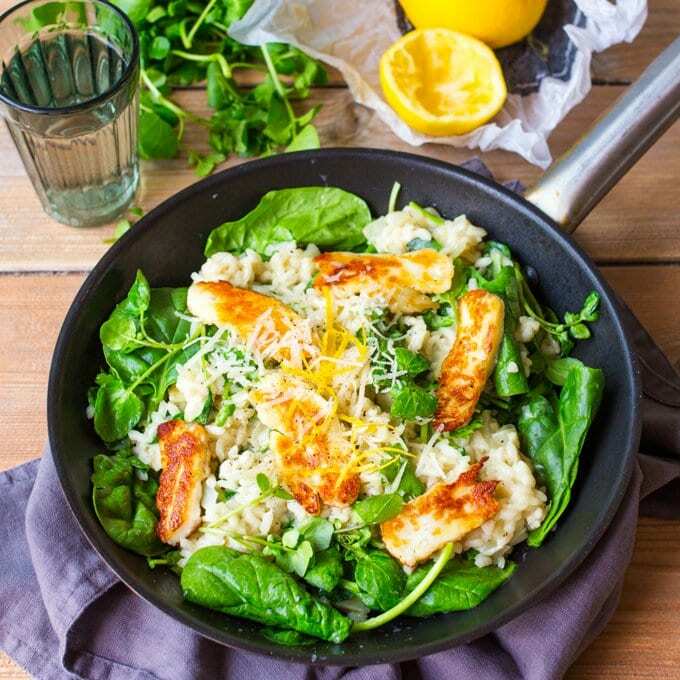 Divide the risotto between 2 or 3 plates. Serve with a squeeze of lemon juice, some freshly ground black pepper, and a couple of slices of prosciutto if you like. Nutritional information is per serving, using white wine and based on 2 servings without the addition of proscuitto. 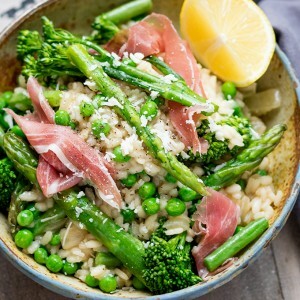 I love risotto, had this with some fresh peas out of my garden. Delicious.